In a Friday Five first, we're handing this week's list over to the talented Lauren Panepinto, the Creative Director for Orbit Books and Yen Press. Ms. Panepinto is responsible for overseeing and designing the astounding array of great covers that come from these imprints, including last year's Inky Tentacle-nominated Equations of Life. After some discussion (hint: never ask the Creative Director of Orbit Books something as vague as "five favorite SF/F covers"), we narrowed it down to the five best tentacle covers in SF/F. When Anne and Jared asked me to do a post on my five favorite SFF book covers, my brain immediately melted - there are just too many great, awful (and great-because-they’re-awful) scifi and fantasy covers, so I suggested we narrow the focus a bit. And we very easily agreed on a very special category, and one near to my heart (and my Pintrest)... tentacles! Call Of Cthulhu 3D (Vintage): Design by Suzanne Dean, Illustration by Vladimir Zimakov. Not only tentacles, but 3D tentacles! Really, no more needs to be said. Kraken (Subterranean Press): Illustration by Vincent Chong. 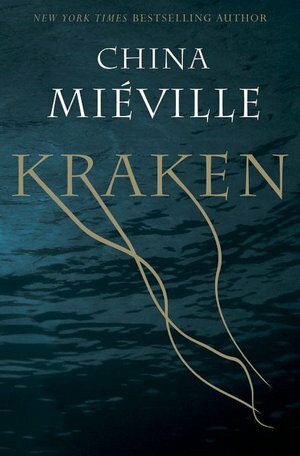 Although I did like the US version (great type) and the UK version (great suckers) it’s the Subterranean Press version that really knocked the Kraken out of the park with the fabulous wraparound illustration. Lovecraft at the Movies (Fall River): Design by Charles Brock/Faceout Books. Winner for lovely concept. Where do the film reels end and the tentacles begin? Proust and the Squid (Harper): Design by Paola Ecchavaria. Type Tentacles! Sense and Sensibility and Sea Monsters (Quirk Books): Design by Doogie Horner. Illustration by Lars Leetaru. Included for best punk of a classic-style cover. Chasing the Moon (Orbit): Design by Will Staehle. Intergalactic Lovecraftian Tentacled Beast snacking on the moon? You don’t get great briefs like that from your art director too often. There’s tons more amazing artwork-of-tentacles, I mean heck, I could do a post just on the top five portraits of Lovecraft with tentacles, but I wanted to focus on covers that weren’t just illustrations of tentacles, but really worked the tentacles into the design, or were fresh conceptually. So, those are Lauren's most delightfully cephalopodic covers - what are yours? Share links in the comments, please - the more wriggle the better!